A pedestrian uses an umbrella to get some relief from the sun as she walks past a sign displaying the temperature on June 20, 2017 in Phoenix, Arizona. Richard Branson has made a career out of disrupting mainstream industries, from airlines and trains to mobile phones and media. Another industry, he writes on his blog, that "is particularly ripe for disruption" in today's world is "air conditioning." "It represents a $100 billion market today and is set to grow to nearly four times that size by 2050," says the entrepreneur. There is plenty of room for improvement, Branson notes, since AC "is based on a technology that has not fundamentally changed since its invention (or rather, accidental discovery) over 100 years ago." As the Rocky Mountain Institute found in its November 2018 report, "Solving the Global Cooling Challenge," "The pace of evolution of the AC industry is alarmingly slow even considering best available technology, especially when compared with some of the recent technological innovations in the century such as LED lighting, solar photovoltaic panels and electric vehicles." Though the best cooling products aren't yet anywhere near as efficient as they could be — they've only reached 14 percent of their maximum theoretical efficiency, the report notes — other technologies have managed to do better: "LEDs have achieved 67-89 percent," and "solar photovoltaics (PV) have achieved 28-53 percent of their theoretical maximum efficiency." Though Branson acknowledges he's not an expert, he also points out, "14 percent seems pathetic." The National Oceanic and Atmospheric Organization explains that "Earth's globally averaged temperature for 2017 made it the third warmest year in NOAA's 138-year climate record, behind 2016 (warmest) and 2015 (second warmest)." And NASA adds, "The planet's average surface temperature has risen about 1.62 degrees Fahrenheit (0.9 degrees Celsius) since the late 19th century, a change driven largely by increased carbon dioxide and other human-made emissions into the atmosphere. Most of the warming occurred in the past 35 years, with the five warmest years on record taking place since 2010." So efficiency in appliances like air conditioners matters because, the less efficient the units, the more energy it takes to cool a building. That leads to more carbon emissions — and more emissions means more warming. As the University of Washington's Conservation Magazine (recently renamed Anthropocene Magazine) summarizes, "Cooling your apartment is making it hotter outside." There is a real need, then, for efficient cooling that doesn't warm the planet, especially since, the hotter it gets, the more people become dependent on AC. "As our planet warms, we need it more than ever to keep our people cool," says Branson. "If we can trigger a major technology change, it could be the single biggest technology-based step we can take to arrest climate change." While there is a lot of potential within the industry, it won't be easy to compete with the large corporations who control the market, the entrepreneur adds: "The control exercised by a small number of players means that entrepreneurs and innovators find it difficult to find their way to buyers (or investors who will back them). 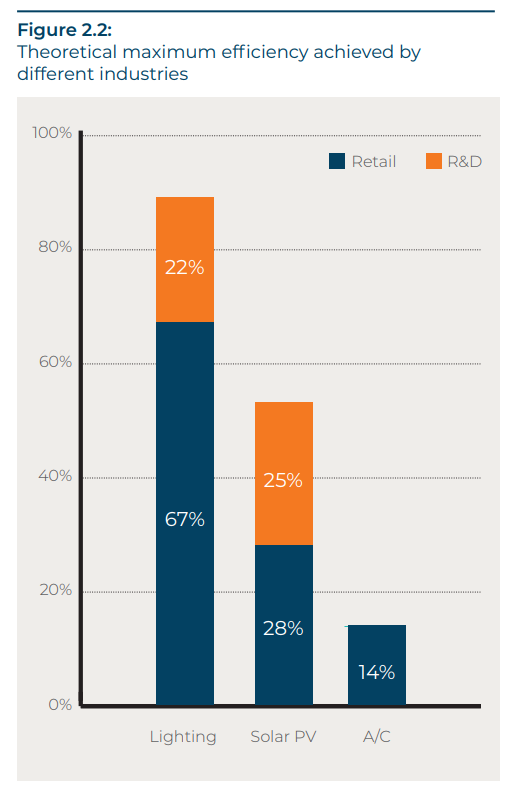 High R&D costs present a major barrier to entry." That said, "none of this is insurmountable," writes Branson. He successfully took on British Airways in 1984 when he launched his airline company, Virgin Atlantic, he says, and "if we can disrupt the airline industry, where a single Boeing 737 can cost north of $70 million, then I'm pretty sure we can do it with air conditioning."